Normally, when an otaku looks for a book in an anime store, it would probably be either a manga, or one of those imported monthly publications like Newtype or Animage, but for anime fanzine staff like us, we also look for things that may provide us with any information about the background on companies in anime related fields. And the "Sunrise Anime Daizenshi" (Sunrise Anime Super Data File) is happens to be the such type of publication we look for. The Sunrise Anime Daizenshi contains information about each and every single anime series the Sunrise has ever been involved in, as well as various background information about the company itself. 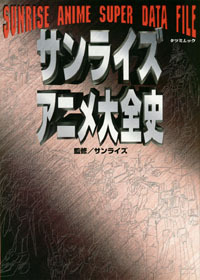 The book starts with the founding of the Sunrise Corperation in 1972 and proceeds into giving details about well known series such as the original Gundam series that was first aired in April of 1979. The data file goes on to cover series such as "City Hunter" and "Dirty Pair" from March and April of 1987, "Samurai Troopers" from April of 1988, "Gundam Wing" from 1995, and countless others. The book even has information on various toys, posters, and other products available. There are even interviews with Sunrise big-wigs such as mechanical designer Oogawara Kunio (who's debut work included "Kidou Senshi Gundam" and "Iron Leaguer"), character designer Shioyama Norio (who was involved in the production of "Samurai Troopers" and "Yuushao Gaogaiga" among many others) and high level staff of the Sunrise empire. Top it all off with a 100% complete list of all animated projects that Sunrise has ever been involved in. The list even includes all the episode titles and subtitles for each episode and the date when they initially aired.